The career of one of the Beltway region’s most legendary boxers came to an end Sunday. 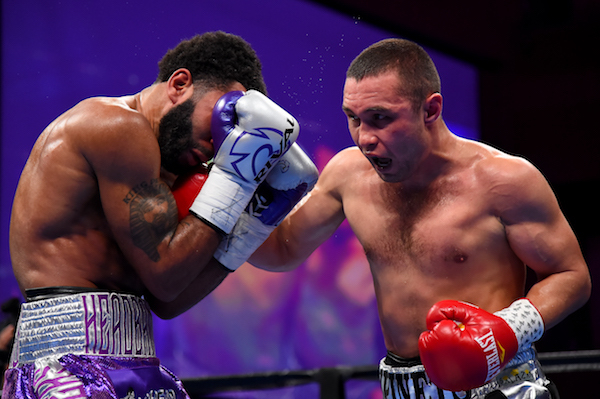 D.C. welterweight and three-time former world champion Lamont Peterson was knocked out in the 10th round by Sergey “Samurai” Lipinets of Beverly Hills, Calif., in the main event of the card at the MGM National Harbor Casino in Oxon Hill, Md. After the bout, Peterson announced his retirement to the crowd and to viewers watching on FS1. “It’s been a long career but today is the day,” he said. The bout was fought at close range throughout, with Peterson successfully landing body shots early. In the fifth, the round-ending bell rang prematurely but neither boxer seemed to be affected. In the second half of the bout, Lipinets took control. In the 10th round, he connected with a solid right hand that made Peterson stumble. Lipinets would throw a series of blows that dropped Peterson to the canvas. Peterson’s trainer and father figure, Barry Hunter, threw in the towel and leaped into the ring to hug Peterson, forcing referee Harvey Dock to stop the bout with seconds left in the round. Peterson ends his career with a 34-5-1 record, 17 of his wins by knockout. 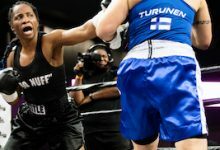 He is one of six D.C.-area boxers to hold three or more world titles in the four major governing bodies (WBC, WBA, IBF and WBO), joining Sugar Ray Leonard, Simon Brown, William Joppy, Mark Johnson and Hasim Rahman. Lipinets, himself a former world champion, is now 15-1, 11 KOs. 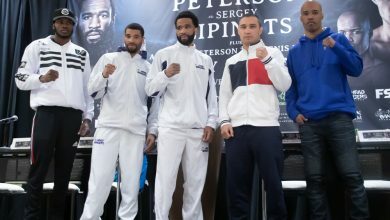 It was a tough night for both Peterson brothers, as super lightweight Anthony Peterson battled Argenis “La Tormenta” Mendez of Yonkers, N.Y., to a 10-round draw. Peterson spent most of the bout on the outside moving side to side. Each man took turns initiating the action but neither gained a strong advantage in the exchanges. Judge John Gradowski saw the bout for Mendez, 96-94 while judge Larry Hazzard Jr. scored the bout for Peterson by the same score. Judge Paul Wallace saw the draw at 95-95. Peterson is now 37-1-1, 24 KOs. Mendez is 25-5-2, 12 KOs. In a close co-feature contest, “The Quiet Assassin” Jamontay Clark of Cincinnati won a 10-round unanimous decision over previously undefeated Vernon “Subzero” Brown of Chicago. Brown, the shorter of the two boxers, landed the biggest blow of the night, a right hand that made Clark stumble against the ropes in the third round. Referee Kenny Chevalier ruled it a knockdown, saying the ropes held Clark up. 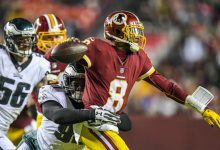 However, Clark was able to withstand Brown’s assault and come back with punches of his own that landed solidly against Brown. Clark won by scores of 96-93 (twice) and 95-94 to raise his record to 14-1, seven KOs. Brown loses for the first time and he is 10-1-1, seven KOs. Alexandria, Va., super welterweight Brandon “Bulldog” Quarles lost by eight-round split decision to Aaron Coley of Hayward, Calif.
Coley was the more aggressive boxer in the contest as he was the first to land shots most of the way. Quarles fought gamely and won Gradowski’s scorecard at 77-75. Judge Dave Braslow and Hazzard both saw the bout for Coley, 78-74 and 79-73. Quarles’s record drops to 21-5-1, 10 KOs. Coley is now 16-1-2, seven KOs. Baltimore super middleweight Lorenzo “Truck” Simpson won a relatively easy four-round unanimous decision over the debuting Jaime Meza of Compton, Calif.
Simpson dropped Meza with a straight left hand early in the first round and proceeded to dominate him the rest of the way. Two judges scored the bout 40-35 while one had it 40-36. Simpson is now 3-0, two KOs. Hyattsville, Md., super featherweight Cobia “The Soldier” Breedy won by six-round technical unanimous decision over Francisco Fuentes of Hemet, Calif.
Gradowski and Wallace scored the bout 58-56 while Hazzard saw the bout 59-55 for Breedy, who remains undefeated at 12-0, three KOs. Fuentes is now 15-8-1, four KOs. D.C. welterweight Kareem “Reemo” Martin won a six-round split decision over Joaquin “Chico” Chavez of Commerce, Calif. Martin was the aggressor throughout the contest but Chavez did not back down. Both men landed nice punches but Martin seemed to have an edge. Braslow and Gradowski both scored the bout for Martin, 60-54 and 59-55, respectively while Hazzard saw the fight for Chavez, 59-55. Martin is now 12-2-1, three KOs while Chavez fell to 9-19-3, two KOs. Clarksburg, Md., middleweight Mark “Sayless” Duncan lost a six-round split decision to Arturo Izquierdo of Las Vegas by way of Costa Rica. Izquierdo had a strong offense in the first two rounds and gained a big advantage when he dropped Duncan with a left hand early in the second round. Duncan, competing in his first six-round bout, was able to come back and make it close, even getting the win on Hazzard’s card at 57-56. Gradowski and Wallace saw the bout at 57-56 for Izquierdo. Duncan lost for the first time as a pro and is now 3-1, three KOs. Izquierdo’s record rose to 6-2, two KOs. In the opening contest, 2018 National Golden Gloves champion Adrian “Playtime” Benton of Cincinnati won a four-round unanimous decision over veteran Archie Weah of Monrovia, Liberia. Benton was dominant and won by 40-36 across the board. Weah is now 2-13. In bouts that took place after the main event contest, Hyattsville super lightweight Patrick Harris won a six-round unanimous decision over Bergman “The Snake” Aguilar of San Jose, Costa Rica. Harris was extremely sharp during the contest and dominated the bout, winning by shutout (60-54) on all three judges’ scorecards. Harris remains undefeated at 15-0, eight KOs while Aguilar fell to 14-5-1, four KOs. Ramon Cardenas, a featherweight from San Antonio, won an eight-round split decision over Ryan Lee “Stone” Allen of Jackson, Mich. Both men were in a very tough, close battle throughout the contest before Cardenas eked out the win by scores of 58-56 on two cards. Allen won one card by the same score. Cardenas is now 17-1, nine KOs while Allen fell to 8-3-1, four KOs. Also, “The Next Big Thing” Keeshawn Williams of D.C. won a six-round unanimous decision over Evincii “Prize Fighter” Dixon of Lancaster, Pa. Williams was in complete control and won by shutout (60-54) across the board. 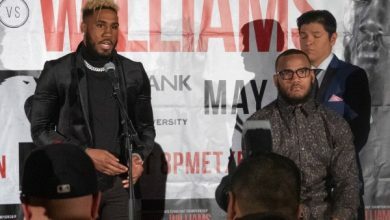 Williams is now 5-0-1, one KO while Dixon fell to 7-22-2, two KOs.